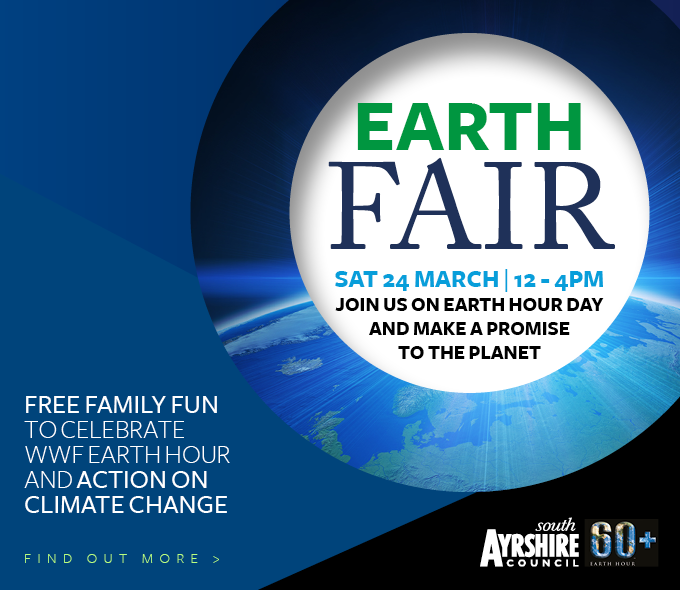 Ayr Central and South Ayrshire Council join forces to stage Ayrshire’s Earth Fair on Saturday,24 March 2018 between 12pm and 4pm. The event, now in its second year, designed to coincide with Earth Hour is billed as ‘free family fun day to learn about protecting our beautiful planet’. The Fair will host exhibitions and interactive displays from local environmental organisations, council programs and commercial enterprises with goods, services and causes that address the environment and quality of life. There will also be plenty of fun children’s activities including hands-on crafts and face painting to educate, entertain and inspire. In the spirit of Earth Hour Day, the team from Creation Station will be running sustainable lantern making workshops, it’s hoped the lanterns will be used later in the day during earth hour, from 8.30 to 9.30pm, to light the way as businesses and households across South Ayrshire switch off their lights, to support climate change action. Visitors on the day will be encouraged to share their promise to the planet across social media using #AyrEarthPromise with the most inspiring shared pledge winning £50 shopping voucher to spend at Ayr Central. This year’s event follows a Council pledge to stop buying plastic straws alongside a commitment to review the purchases of all single-use plastic items by 2022 to ensure sustainable items are bought in future. Councillor Ian Cochrane, South Ayrshire Council’s Portfolio Holder for Sustainability & the Environment said that this year’s Earth Hour had added resonance, “We’re committed to protecting our environment and this pledge to eliminate single-use plastic items is a great way to reduce unnecessary waste, much of which ends up dumped in landfills. “We’re starting the process by moving to paper straws and in the next four years, we’ll be looking to source items which cut down waste and ultimately encouraging a culture shift in people’s use of everyday items.